As the name implies, this is a customer favorite. 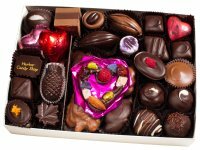 30 or more pieces fill out this box: a variety of foiled and filled hearts, truffles, turtles, caramels, nut bark, praline sandwiches, mendiant heart, coconut snowflakes, peanut butter cups & specialty confections. This is an assortment of both milk & dark chocolate.